Congratulations Caring Pharmacy for celebrating their 24th year of practicing community pharmaceutical care this year. It has been shared that their pharmacists meet many people who come to them for health advices & one of the frequently asked advices is about diabetes everyday. The customers are very concerned on how to control their blood sugar levels & not many of them have enough information on how to manage it. From left to right: Emcee Nazrudin Rahman on stage with Mr.Lam Kai Kun (Executive Director, Malaysian Pharmaceutical Society Secretariat), Mr.Chong Yeow Siang (Managing Director, Caring Pharmacy Retail Management Sdn. Bhd. 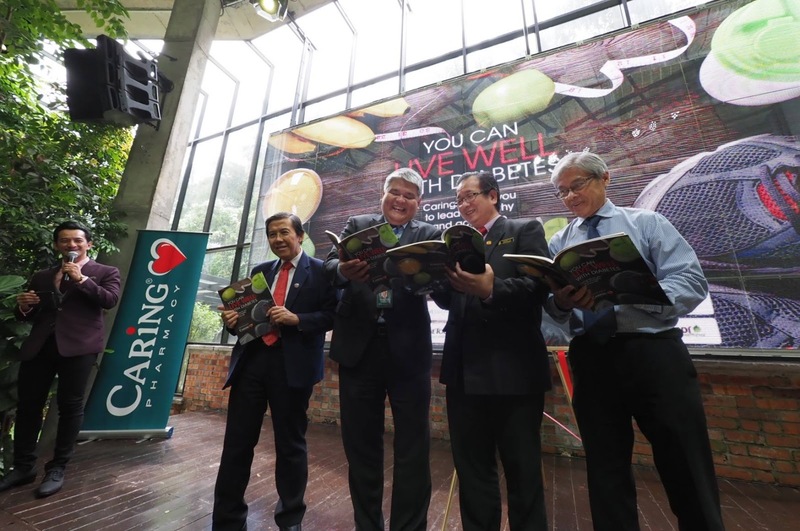 ), Mr. Andrew Tan (Deputy President , Malaysian Pharmaceutical Society) and Mr. John Chang (Council Member, Malaysian Pharmaceutical Society) as they are holding the newly launched “You Can Live Well With Diabetes” book by Caring Pharmacy. 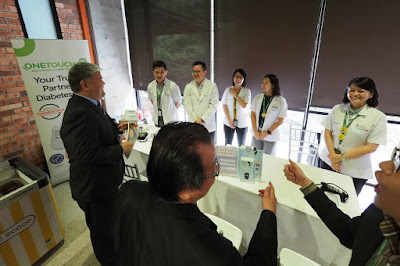 Throughout these few years, Caring Pharmacy has organized many events, talks and workshops where they educate the public on Diabetes Management. 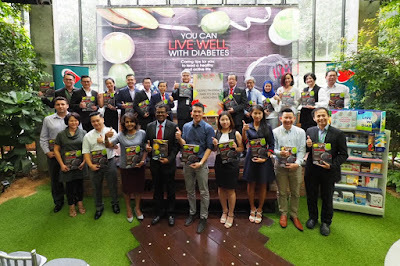 This year, they have decided to take another step forward to create a book “You Can Live Well With Diabetes” that would benefit not only diabetics, but also non-diabetics. This book is packed with useful facts and effective tips to allow readers on how to improve and achieve optimal health despite having diabetes. Some of the topics included in this book are diabetes & its side effects, medication monitoring, diabetes-friendly nutrition, exercise routine for diabetics & other important aspects of diabetes care. The book will be available in limited quantity at all CARiNG stores with storewide purchase of RM80 & above and upon completion of a short questionnaires. 12,000 copies of the books will be given away and it is strictly while stock last. 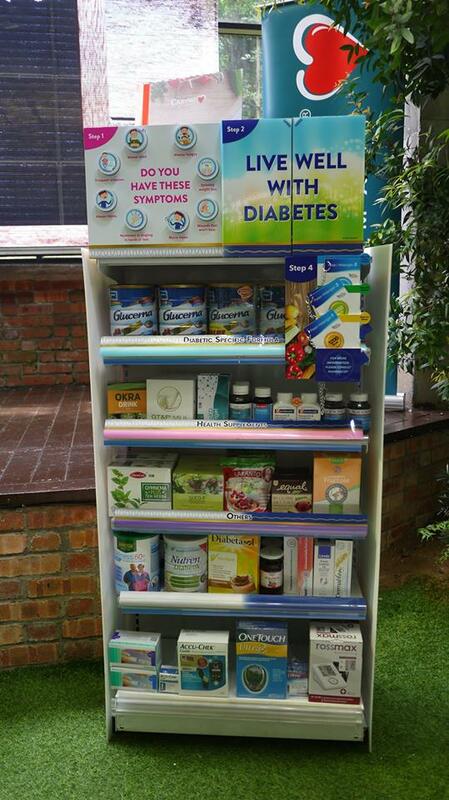 targeted to people with diabetes and people who want to manage their sugar intake to lead a healthier lifestyle. The shoppers can get to know their BMI by using the BMI calculator at the corner and our pharmacists are able to refer a meal plan suited for them to apply a better and healthier diet. 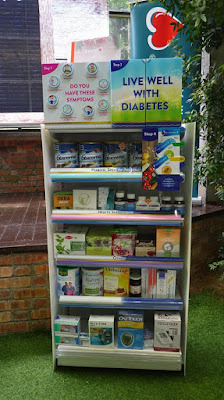 Another purpose of this corner is also to serve as an educational corner whereby diabetes-related information will be displayed and our pharmacists will be able to recommend professional advice on diabetes management that is suitable for the individual. With conjunction of World Diabetes Day in November 2018, CARiNG Pharmacy also offers 4 blood glucose tests at RM10 at all stores to consumers. Additionally, the FREE HbA1c test is opened to chronic diabetic customer who made any purchase of diabetes medications at selected CARiNG stores to who are in need. It is limited to 20 customers only per outlet and terms and conditions apply. HbA1c test measures your average blood glucose level over the last 2 to 3 months. For most people with diabetes, a level of 7% is the target. This campaign was launched by CARiNG Pharmacy Managing Director, Mr Chong Yeow Siang, together with 16 reputable pharmaceutical companies and brands in the country which are from Abbott Nutrition International, B.Braun, Blackmores, CAMBERT, CYPRESS MEDIC HEALTH, Earth Living, Funtastic Sky, GTF Retail, HERBS OF GOLD, LIfescan, MSD, Natures Scienceuticals, ROCHE Diagnostics, Saraya Goodmaid, VITA Health Malaysia, Vital signs and INOVA Pharmaceuticals. 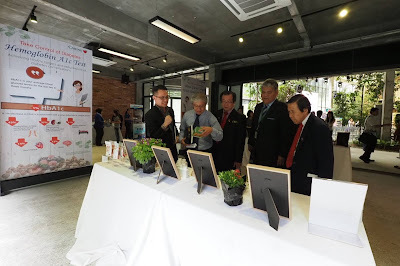 Meanwhile, Mr Andrew Tan, Deputy President of Malaysian Pharmaceutical Society (MPS) and Mr Lam Kai Kun, Executive Director of Malaysian Pharmaceutical Society Secretariat has been invited to witness the official launching. In the event, guests and members of media is having a close session with CARiNG pharmacists on free health screening and counseling. Educational booths are set up for sharing the latest health related products and information. While diabetes is currently incurable, CARiNG Pharmacy strive to play a key role to support the communities in diabetes management through various initiatives. For more information, visit CARiNG Pharmacy's website.